Picking exact market tops and bottoms is far more art than science, if it’s even that. Flat out random luck has more to do with it, given that bottoms are usually found in the midst of logic-shredding panic, meaning your well-reasoned explanation of why we’re at the bottom takes place in an environment where reason is not driving much of anything. Tops, on the other hand, are often ess dramatic. When markets melt up over time, there is often no signifying event, no mass upside hysteria, to note. Just another day when the market wandered up a few hundred points because that’s what the market just does these days. 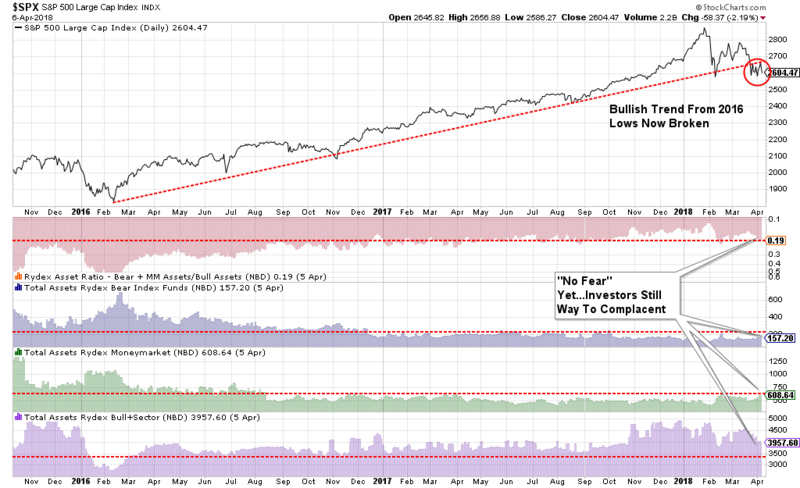 I highly suggest you use any substantial rally to reduce risk and rebalance portfolios accordingly. Why? Because I am going to out on a limb and making a call. I think the 9-year old bull market may have ended in February. There was a moment of clarity as I penned a list of challenges weighing on the economy, and the markets, which are very different from where we were back in 2009 or even in 2016. In 2015, the market plunged as Fed Chair Janet Yellen brought QE3 to its conclusion and started hiking interest rates for the first time in 9-years. Again, this correction would likely have been substantially deeper as the Eurozone faced “Brexit” which sent shocks through the market. The well-timed phone calls to the Bank of England and the European Central Bank by then Fed Chairman Yellen, to take over liquidity operations stemmed the decline. Also as opposed to 2000 and 2007, the Fed had only just started its rate-hiking campaign. The backdrop of the market currently is vastly different than it was during the “taper tantrum” in 2015-2016, or during the corrections following the end of QE1 and QE2. In those previous cases, the Federal Reserve was directly injecting liquidity and managing expectations of long-term accommodative support. Valuations had been through a fairly significant reversion, and expectations had been extinguished. None of that support exists currently.